Anticipating the need for a greater overnight guest capacity, and always being intrigued with finding new uses for old resources, Ed and Darlene Lowe decided to put a retiring piece of Americana to work in a whole new way. In early 1990, five railroad boxcars were purchased in Detroit from Grand Trunk. Each weighing about 20 tons, they were shipped to Cassopolis by rail, then brought the last few miles to Big Rock Valley by semi-truck. 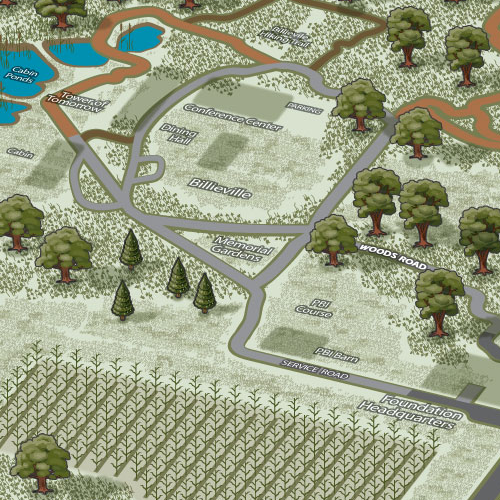 The cars were moved into a clearing in the woods at the Billieville Conference Center complex, arranged in a semi-circle, and set on railroad-track bases. An addition was built on the side of each car to accommodate a large bathroom, entry, and utility area, and the main space of each car has been partitioned into a sitting room and two bedrooms. The interiors are tongue-and-groove paneled, and bunks, dressers, and closets are built-in, using wood harvested and milled on the property. Four cars can comfortably accommodate eight people, and one is designed for a maximum of four. This boxcar “village” complements one of the earlier pieces in the railroad collection: a caboose that sits by itself not far away, one of Mr. Lowe’s favorite “pondering spots” overlooking the woodland ponds. The finished boxcars enclose a park-like area where there is a large figure of Casey Jones that Ed and Darlene brought home from Boyne Falls. A campfire pit and picnic tables complete the scene and make an excellent location for enjoying s’mores. The Billieville Conference Room and Leisure Center are nearby; all in all, a beautiful, rustic, yet modern and convenient setting for a group event.